SUBFAMILY HELIOCONIINAE(FAMILY NYMPHALIDAE).Acraeidids breed mainly on granadilla,from which they extract toxins that they use to deter predators. 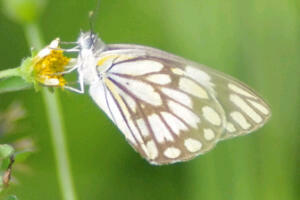 ZEBRA WHITE Medium-sized (50mm) ,unmistakable, black with creamy white bars with creamy white spots dry season form black areas on the underside of wings replaced with brown or light pinkish colour. Fly very low with high speed don’t sit still for long don’t like the 13hoo sun . But rather at 11hoo one could easily spot them . 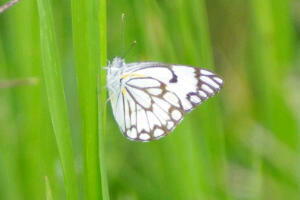 On long tall grass or green leaves. The larvae feed on Shepard s tree as well as Bush Cherry. Loves open country as well as the bushveld. I took this photo in Nelspruit. But they are found throug out South- Africa. So go on and explore your garden.